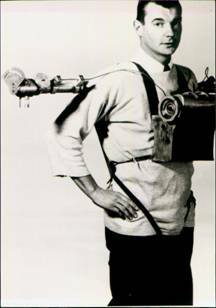 During the late 1940s, Thomas T. Moore (no relationship to Wendell Moore), then assigned to the Von Braun rocket team at the Redstone Arsenal in Huntsville, Alabama as a civilian radar expert, experimented with one of the first rocketpacks designed for individual flight. Von Braun was working towards putting a man in a rocket; Thomas was working on the notion of a rocket-powered man. He called his device a Jetvest and flew it for the first time in 1952. For a moment, he was airborne, lifted into the air by pure rocketpower. Though limited military funds would not encompass a completely finished model, Thomas proved that a man-rocket combination was feasible. Thomas Moore obtained his degree in higher education from Purdue University in Physics. Soon after graduation, he worked at the MIT Radiation lab during WW2 on Radar development under a contract with General Electric. He was assigned to work at Fort Bliss, Texas under GE contract with German Rocket experts under “Operation Paperclip” and during this time, he became a confidant and traveling companion with Dr. Werhner von Braun. 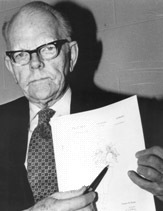 In 1947 he first discussed the idea of applying rockets to a man with Dr. von Braun, Eberhard Reese, and Arthur Rudolph. The Rocket Team moved to Huntsville, Alabama Redstone arsenal and Tom moved with them, becoming a civil servant with the Army. In 1950, with the help of Dr.’s von Braun and Reese, he obtained $25,000 for a study task for his jet powered idea,Tom had also been motivated by a Russian patent on such a device in 1928. 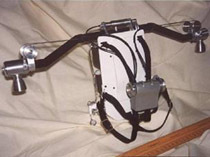 Tom Moore, Herman Beduerftig, and Werner Voss flew the tethered rig (see pictures of the set test above). 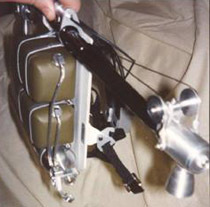 The hand controls were operable and did allow some degree of control, while flights were initially powered by compressed air and then nitrogen, eventually Hydrogen peroxide was used as the final and proper fuel propellant. The source gas supply and H2O2 were all stationed on the ground in a pit area on the arsenal. The military refused to extend Tom’s funding for developing a self-contained system, even though he had the full support of Dr. von Braun. 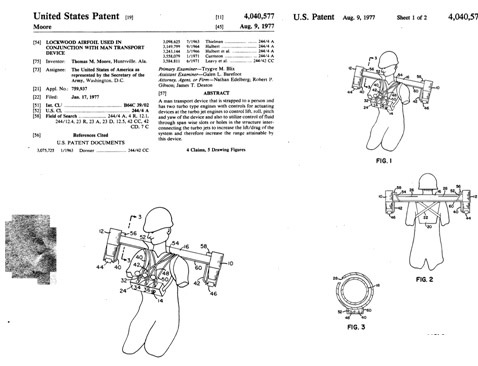 The Jetvest was considered a “far-out” device or even laughable by some in the military and when the military later decided to investigate a “battlefield mobility device”, the they invited contractors, but “they didn’t invite us” as Tom later stated. 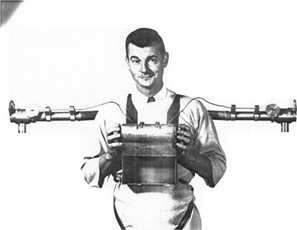 Officially, Tom went on to work on missile guidance issues, but unofficially, he continued his interest in putting “rockets on a man” and became very interested in “high lift” devices, work at VTOL at a number of aerospace contractors, and performance enhancements for small jet engines and he felt it was possible to apply a “Lockwood” wing to a jet powered jetvest or rocketbelt and greatly increase its range.The “Lockwood” wing utilizes forced flow over the wing planform to increase lift…..The Coanda Effect. 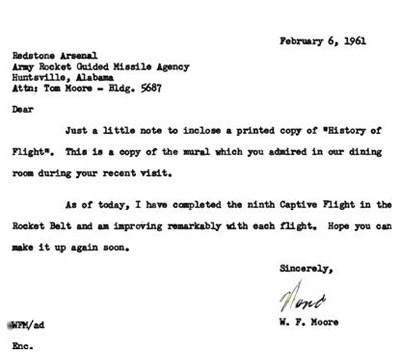 Finally, both Wendell F. Moore of Bell Aerosystems and Thomas Moore of Redstone Arsenal, knew of each other’s work, as evidenced by correspondence between the two scientists. It is unknown if they collaborated side-by-side on each rocket powered device designs.